“They have a habit of saying ‘f@#k you London!’” Tim Walker speaks to Andy Brydon about the end of URBIS. So where did the idea initially come from then? As part of the ongoing project that is, or more specifically was Urbis, there was always a real pressure on us to make it relevant to local people. The first project I did was 25 years of the Hacienda. Getting into that world it became really apparent that British black music and culture is vastly overlooked in the history of British music and has never really been taken seriously by a national institution. Everyone assumes the Hacienda has purely a Mancunian music background, but this black music culture came through and there was a synergy between the two scenes. There is a great story to be told, a brilliant hero narrative of great success and great failure. It’s more of a classic Hip Hop tale then going down the route of say Chipmunk, Dizzee Rascal and N Dubz. You can draw connections but the dust has yet to settle on what those connections are. Urbis is closing so have you any plans to tour the show? I would love to tour it, but the state of the creative world at the minute is that it’s in disarray. Here at Urbis we were unique in our urban culture representation and no one else has been hitting that nail, and Manchester won’t anymore when this building closes as it stands. I think the successes that we have had have shown that there is interest in it but it requires the same amount of backing and support as the fine arts to make it presentable in a way that people expect these days. Hacienda, Emory Douglas, Hidden Manchester to name a few. I think the ability to turn around what was initially a bit of a white elephant, put together by a committee of people that tried to please everybody but ended up pleasing nobody is pretty special. This place is iconic in the eyes of Manchester. Money, pure and simple. The football museum has an opportunity to come here, which I think is great for it and Manchester, but it’s going to leave a huge gap in the cultural spectrum of our city. 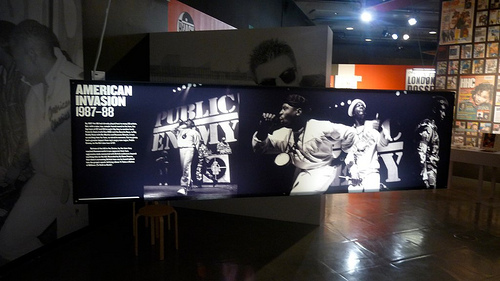 What about a permanent UK Hip Hop museum, is there a gap for one? Baring in mind what I just about the commercial pressures put on institutions at the minute I would also say that the audience just isn’t big enough for something that is UK specific. Again, money is still an issue in London. It’s a balancing act, and you do have to kind of commercialise your work, but then again Hip Hop has been very good at that. In the UK what we came across when trying to secure sponsorship and funding, is that a lot of the big corporations don’t want to touch it because they associate it with all sorts of thing like knife crime: you say Hip Hop and people immediately think Gangster Rap. Was the emphasis always going to be on photography? It’s a weird thing, the emphasis was never meant to be on photography. The problem is that we came to the hiatus of what was 30 years, give or take, of Hip Hop. It’s just reaching that point where people’s stuff that they have been lugging around had become junk before it became valuable again. James McNally and I came up with the idea of a euphemistic attic, because we would ring people and they would say ‘I think it’s in my mum’s loft!’ We had to go and find this stuff. I think we have done a pretty job of getting artefacts together, it took 6 months. 6 months, that’s very impressive! Behind the curtain of what gets shown there is a hell of a lot of work that goes into it. Let’s talk about the film, it almost overtakes the whole exhibition, it could even be there on its own. That was always the idea, the film was developed by me and Teddy Nygh, and the purpose of it was to explore the other side that had spun out of the hard Hip Hop industry at the end of the 90s. The idea was always to look more at how Hijack tied into Jungle and Garage and how that scene has fed into the development of more current forms like Grime and Wonky, Drum & Bass and Dubstep but always tying it back to the Reggae routes that underpin UK Hip Hop in the first place. You have someone like Rodney P who ties it all together because of his sound-system background coming through that Raga Hip Hop sound. He has been an inspiration to so many people from all quarters. Yeah I think that the way that its cut does say that, but there is more material to set it in context. Where it is in the exhibition hopefully does that, because where the exhibition takes you is one way and the film another way. We weren’t here to look into a crystal ball. That’s why at the end we have the juke boxes with all the tunes on, and people can decide for themselves where it’s all come from. The aim is to provoke thought and hopefully to inspire debate. What are the reasons behind UK Hip Hop going through a low patch at the moment? If you speak to someone like DJ Semtex he will tell you that Grime is UK Hip Hop now, and his view of older style Hip Hop artists is pretty mediocre. It’s lost the backing of any major labels and the music industry is changing so rapidly at the moment that the notion of a specific genre is dead. The notion of being just a Hip Hop fan these days is redundant, because gone are the days when you had to save up and spend £40 on an import when you can download it for nothing. Anyone with a PC and a broadband connection can set up a home studio and so Hip Hop in its purest form is going through a tough time because maybe people have been short sighted about what it could be and what it could become. Other people who are making new music and experimenting have a much more upbeat attitude because for them it has provided the tools, the knowhow and the attitude to make and innovate. Do you need the notion of a genre anymore? Certainly, Hip Hop, style wise has infiltrated everything. You look at Manchester on a Saturday and you have loads of kids looking like Flavor Flav from the 80s, minus the clock! It’s not even people that are into the music! Completely. It’s just inherent in trying to sell to youth culture. It seems to me that Hip Hop in Manchester fails, why? One reason is that Mancunian artists of any genre are fiercely Mancunian, so they have a habit of getting to London and being on stage in front of loads of A&R people and saying ‘**** you London!’ It worked for Factory Records. I’m proud to come from a city that is proud to be independent and of itself but sometimes it shoots itself in the foot with its big mouth. A modern day example would be Broke ‘n’ English, they work hard and put in the hours but there is always a Manchester reference which I don’t think people outside of the city are prepared to engage with yet. How many visitors have you had? And how does this compare with other exhibitions at Urbis? I was hoping for more, but I think the announcement that Urbis is closing has really hit people coming into the building. A lot of people assumed it is already shut. I’m really happy with the exhibition and I would love to keep it alive if possible. I couldn’t possibly reveal any allegiance!